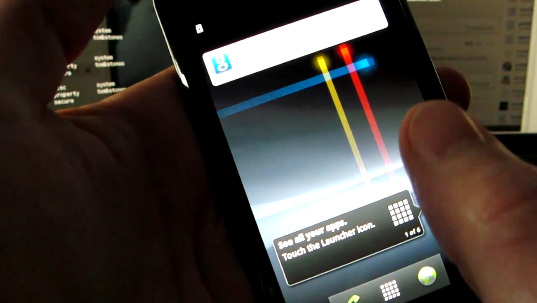 It’s just a one day to availability of first Android 2.3 powered device, Google Nexus S and android devs have already started showing interest in it. Earlier we saw Google Nexus S bootloader unlocked and root access acquired within few hours, now here is real gem out of Nexus S, François Simond an Android deloper with supercurio twitter handler managed to port Android 2.3 gingerbread on Samsung Galaxy. According to Simond, due to the fact that the Google Nexus S shares much of the same hardware, the port was quicker than many expected. This could be real good news for Samsung Galaxy S owner planning to sell Galaxy S and buy Nexus S for the sake of enjoying stock Android 2.3. With this port you can expect whole lot of new features which Andorid 2.3 has to offer on your Samsung Galaxy S. The port isn’t 100% working as the moment, there are things like WiFi access, button mapping, and service etc which needs to be worked and devlopers planning to quickly nail down the bugs and get the full functional Android 2.3 on Galaxy S.
The port is not yet available for download, but you may expect the port to launch fairly soon which is promised not just for Galaxy S devices but also for AT&T Captivate and T-Mobile Vibrant. Thanks to Kenneth of Briefmobile for hat tip.